Can you tell me more about the “Design Phase” of your process? My painting process is dynamic. The inspiration and beauty that makes what I do a work of art happens when I am onsite, actually painting. This is bad news if you want to know exactly what the artwork will look like before I begin. However, from experience, I know this is great news for my clients. A fundamental truism with murals is that what looks great on a sheet of office paper does not necessarily look good in full size on the wall or on the front of your building. We want to create an integrated experience of the art, considering all surfaces, and how the art will move through and interact with the space, the light, the viewer. It is an equally fundanmental truism that people who hire me want to have a pretty good idea of what is going on that 50′ wall before I begin. There are real life hurdles like city approvals or buy-in from spouses that a cohesive design can help to navigate. I do the best I can with the secondary tools at my disposal to communicate with my clients what the artwork will look like. The short answer is that the design I create for each project varies depending on the project. For example, for an underwater mural I don’t create a “mini mural” that describes where every fish and plant will go. We would curate a “species list” together of the plants and animals that will defintely appear in the mural. We will use a fan deck to pick out a lightest and darkest blues together. We will share images of other underwater art and past murals of mine to discuss the elements we want to include. I might create a pen and ink that blocks in where the “big stuff” like a shark or sea lion might go. When I start painting, the design specs serve as a reference for me, a launch point. But once I begin working on the piece onsite, I am calibrating the artwork to the specific space. Once I was onsite and painting, almost every element was tweaked in some way. 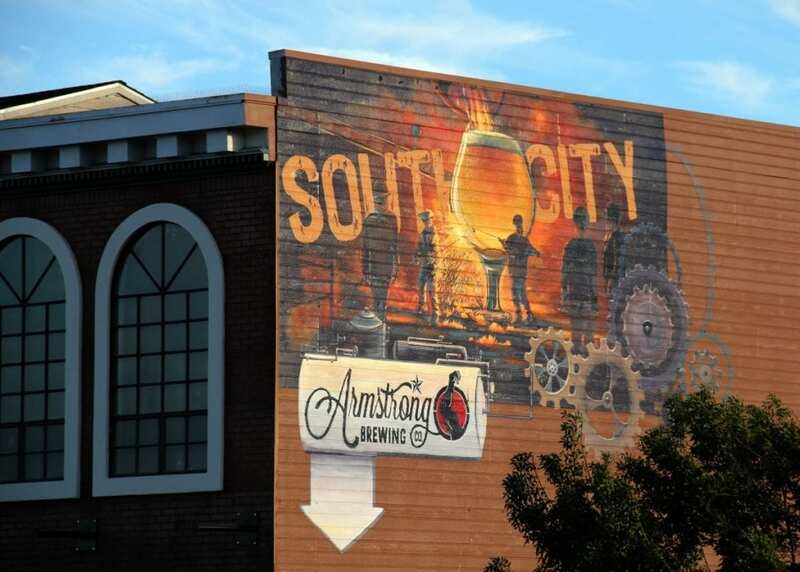 For example, I felt the Armstrong Brewing logo was too isolated from the rest of the mural, so turned the sign into a brewing tank and pipes and gauges used in brewing to integrate with the steelworking elements from the center concept. 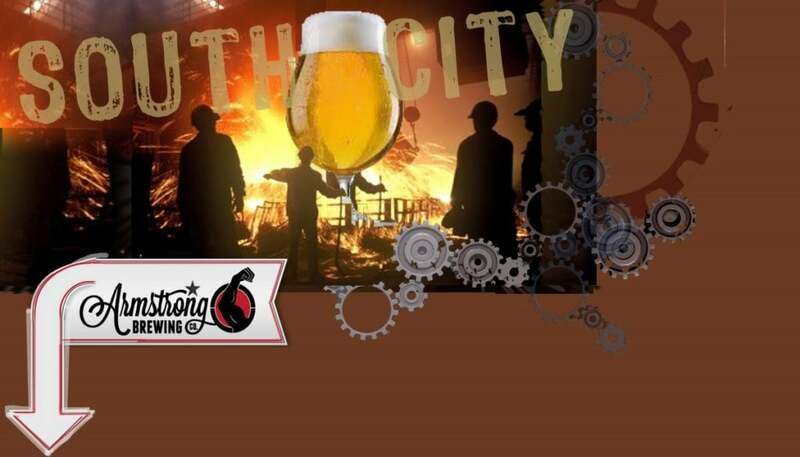 I added the molten pour from the top to further reinforce the parallels between the history of South City as industrial working class town and the brewery as a reinvention of local craftsmanship. The background beam of steel made the composition more dynamic and was an afterthought for balancing out the sloped lettering. The scale of the gears in the design were to small to be read from the distance, so I went for bigger and fewer. Because of the distance I also decided to pop out the figures with orange highlights. You can barely see it in the distant photos, only the close ups, but it helps pop the figures out and accomodate for the viewing distance. We also made one of the figures a woman to reflect the ownership of the business. Even though we were happy with the design we started with, there was plenty of onsite modifications that were substantial improvements that we wouldn’t have been able to predict before the work began. Bottom line: The design we create together is a launch point. The spirit of it as a work of art comes to life in the painting process.